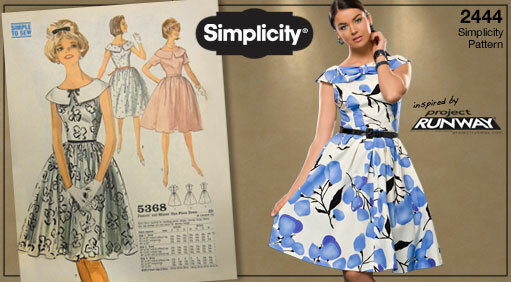 Vintage-inspired Simplicity patterns giveaway! And, How to Wear DIY. Very exciting post today. 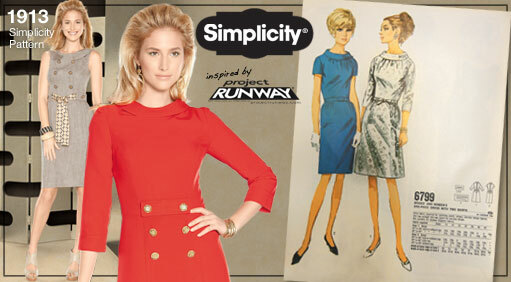 Simplicity has asked me to spread the word about a super fun giveaway they're doing, inspired by looks of the past! They're giving away five packages of three patterns each--consisting of patterns 1913, 2282, and 2444. . And, to get you in the mood, they've asked me and several other sewing/style bloggers to make up one of the patterns! Here are the patterns you could win! Simplicity sent me these patterns and asked that I make one of them up to share with you. Now you may remember that I use Simplicity 2444 all. the. time. for many, many dresses (some: my ivory net dress, a party dress with vintage lace, this brocade dress, this circle skirt dress, vintagey dress I wore in engagement pics, and more--I recently traced it into a permanent pattern!). So I thought I'd try something new this time, and I was very happy with Simplicity 1913 as well! Here it is--the basic nuts and bolts of it is the princess-seamed bodice and your choice of sleeves, collar, skirt, and details. I used a vintage pale pink twill. It's not that vintage, but I got quite a few yards in the fabric section at Goodwill and it had that moth balls/attic smell. Don't worry, I washed it! I love the faux Peter Pan collar option 1913 has, and I used a classic 60's-ey white pique that my mom had some small pieces of. I used a crisp cotton batiste for the back of the collar rather than self-fabric; would have been too bulky. One thing I did change was, rather than use either of the skirts in the pattern, I just did two panels of fabric and pleated them to the waist. Directional knife pleats away from the center front and back. It's definitely shorter than June Cleaver would have worn, but that keeps it feeling current. I like having a full skirt on a girly, vintage-inspired pastel dress! I gave the bodice a full lining of a lightweight pale pink cotton, and the skirt was a great weight as-is. I love working with cotton twills, really; they're substantial and easy to press and cut and they stay where you tell them to! The belt is probably vintage '80's, but... oops. The dress was made for being belted! Sweater: Nordstrom Rack (similar). Earrings and belt: Vintage. Shoes: Liz Claiborne, Marshall's (similar). Nail Polish: Essie Tart Deco. Dress: DIY! 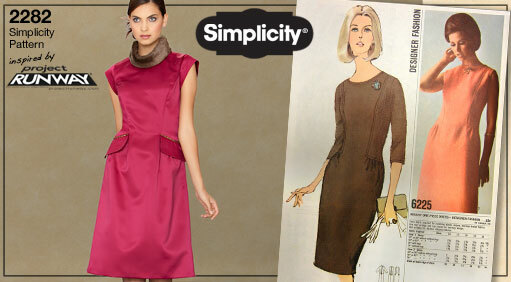 Hopefully you're inspired for some vintage-ey sewing, but either way--check out the Simplicity giveaway and good luck! It runs today through April 15th. How fun! You dress looks lovely. Thanks for the heads-up about the giveaway! You look awesome!!! Is that a tattoo I see? i love this little dress!!!!! I love your dress. I actually own the original 6799 pattern and was getting ready to make a dress from it! Oh, how cool! The original is definitely different, but same era/vibe, super cute! Very cute - and nice styling with the little sweater and belt. You're right - the dress wants a belt! So cute, Suzannah!!! I love how you changed up the pattern, styled for the holiday, and of course am obsessed with Tart Deco (even though it's not a great color for me)! Thanks! Yeah fun color. Bout to do a pedicure with it now, actually! Love it with the sweater!! That's so cute! I saw your name on the email I got a little earlier from Simplicity and I thought the 2444 pattern was so you. Oh, cool!! Yep, 2444 is like my go-to. Lovely dress, I love the way you have styled it with other neutral colours. the dress looks tight. like you didn't leave enough ease. also very short, hope u r wearing tights with it!! Well, thanks for your concern, but nope, it feels like a very comfortable and wearable length. And the fit feels great! I hate when clothes are baggy and frumpy. Hey! Just found your blog and i love it! Nice work :) I'm also a dressmaker and am loving your stuff! Thanks, glad you found me! You've made some awesome dresses on yours!! I'm new to your blog, and I'm so glad I found it! This dress is super cute! Thanks! Welcome, good to have you! Very pretty. I want to make this one for me now.